Here's an amazingly well written and informative article which I'm using in the form of a bio. If I'm violating any copyright laws by putting this on then please e-mail me and I''ll take it off immediately. One--count it, one--year ago, the only people who'd heard of Shania Twain were die-hard country music fans. Today, her albums sell by the truckload. Johanna Schneller meets the woman behind the fame. One--count it, one--year ago, the only people who knew Twain's music were die-hard back-combers. But that was before her second album, The Woman in Me, sold one million copies here and six million copies worldwide. That was before she swept the Canadian Country Music Awards last September, winning five honors including best album, best single ("Any Man of Mine") and top female vocalist. That was before she sang for President Clinton at a November gala, and before she danced on a float with a giant turkey in Macy's Thanksgiving Day Parade. That was before she was named best new vocalist at the American Music Awards in January, won a Grammy for best country album in February and was nominated for seven Juno Awards. Says Cliff Dumas, morning deejay on CISS FM, Canada's biggest New Country radio station, "Anne Murray cracked the door to success in America. Michelle Wright wedged it a little more. Shania blew it wide open." Shania Twain is back-combing my hair. We're in her hotel suite in New York, and she's standing behind my chair. Good thing I'm sitting down: even with flat hair, next to the petite-yet-curvy Twain, I feel as big as a Santa Claus Parade float. "You don't know how to do this?" Twain asks. Her voice is friendly and full of energy; it turns up at the end of sentences like a verbal smiley face. (She also possesses a jawline like a speedboat and melted-chocolate eyes.) "It's very easy. You just hold a handful like this, and push the comb down toward the root? Now, feel what it does to your hair." She shakes her head. "I can't believe you don't know how to back-comb." Maybe she thinks I'm making fun of her. 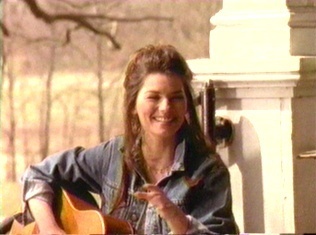 Certainly every aspiring country singer knows how to tease her hair into a commanding cloud--and Shania Twain, 30, has used her share of hair spray on the road from child stardom in Timmins, Ont., to smashing success in Nashville, Tenn. Or maybe she's simply so new to fame that she doesn't trust any of it. Now, here she is, on the verge of eternal fame--and on the island of Manhattan--to shoot the video for a rompin', stompin', drum-heavy tune called "If You're Not in it for Love, I'm Outta Here!" She's waiting for her wardrobe woman to arrive with the pair of black velvet, lace-front, bell-bottom hip-huggers made to Twain's specifications during a five-hour fitting. The pants were cut too low; emergency procedures were performed with spandex. The reconfigured pants fit like the skin of a sleek seal. In the caramel-colored marble lobby of a Manhattan courthouse, Twain winks at a large camera that zooms around her on a U-shaped track like an oversize model train. She's wearing The Pants, plus a red chenille cropped turtleneck (Twain loves to wear black, red or white) and an expanse of flat stomach. "This is the midriff year," she says, laughing. "Who knows what it will be next year? I hate my legs, so I'll never have a leg year." Welcome to the land of New Country, where midriffs abound and cryin' is passé. Though they still twang with traditional steel guitars and fiddles, Twain's songs--all of which she writes or cowrites with her husband, top record producer Robert John (Mutt) Lange--are more about strength than weakness. Equal parts femininity and feminism (as in "The Woman in Me": But I can't always be/the rock that you see), they strike a '90s chord with both women and men. When a guy cheats in Twain's song "Whose Bed Have Your Boots Been Under?," does she beg him to come back? Oh, no. She sashays out the door in a slinky red dress, smiling. Twain's songs may be jauntier than New Country king Garth Brooks's (he tackles modern themes like spousal abuse and single parenting). Still, an iron thread of authenticity runs through her music. She's able to joke about heartbreak because she's already survived much worse. At the video shoot's dinner break, when everyone else is chowing down on Chinese takeout, Twain sneaks off to her trailer with a plate of rice. Just rice. She's been a vegetarian for two years. "If I ever get fat because I eat too much? I couldn't be satisfied with myself," she says. "Because I would think, 'There's extra pounds on me, and there's kids out there that....' I sure could have left a little, and not consumed it myself. When I make dinner, I'm perfect at just making enough. My husband says, 'What are you trying to do, starve me?' But it's the mind-set of my childhood, the grooves that end up in your brain." Because it has a happy ending, Twain's childhood now reads like the stuff of country legend. But it didn't seem romantic back in Timmins. Gerald Twain was an Ojibwa forester; he and his wife, Sharon, raised five kids (Shania, who was then called Eilleen, was the second-oldest). There was never enough money. "In my house," Twain says, "it was so wrong to take more than your share. If you decided to take an extra potato, someone didn't get a potato at all." She remembers gasping when a visiting friend poured herself a whole glass of milk. "To us, eating like that was only on TV." At age 3, little Eilleen started harmonizing to the country music the Twains played on the radio, inventing parts that weren't there. When she was 8, her parents would wake her at 1 a.m. so she could sing in clubs after they stopped serving liquor. Twain dreamed of records, radio and Nashville. The family cut corners to buy her a microphone, sheet music, stage outfits. Twain hid her poverty from her friends at school. "I did a good job too. But you know what? I recognized as a kid that I wasn't the worst off. My mother had a lot of pride. We never went to school dirty or in ripped clothes. I always think of 'Coat of Many Colors,' the Dolly Parton song? So when I would see another kid that was dirty, I knew they didn't have the loving parents I had." That's why Twain feels no resentment toward her parents for encouraging her to work (they counted on her income, which soon approached theirs). "They weren't living vicariously through me or anything like that. I think the only desperation was to have a child that succeeded," she says. "It's like, if you have an Olympic athlete for a child, you are going to bite your fingers to the bone, wanting that child to succeed." Her parents never got to see a Shania Twain record. When she was 22, they died suddenly when their car crashed into a logging truck. Twain became surrogate mother to her three younger siblings, and sang wherever she could earn money, including a three-year stint doing six shows a week at the Deerhurst Resort near Muskoka, Ont. She changed her first name to Shania, an Ojibwa word that means "on my way." When her siblings felt ready to go their separate ways in 1991, she headed to Nashville. Two years later, her billboards were towering over the streets. Twain and Lange began writing songs together long-distance, then fell in love on a working trip--in Spain. "Looking at him the day I fell in love, and looking at him the day before? Two different things," Twain says. (Sounds like song lyrics to me.) They married in December 1993, six months after they met. That's another thing Twain has: a 2.5-carat diamond ring winking on her finger. Lange proposed in Paris; he flew Twain's sisters there to keep her company while he worked in the studio. And let's not forget the velvet pants. What Twain won't forget, however, is that a few short years ago she was kneeling over a cold river to wash her family's laundry when their well went dry and she couldn't afford to bring the clothes to a laundromat. "That's a part of me I want to try and keep. I think it keeps things in perspective. It keeps you from expecting too much and being let down," she says. Let down. Twain knows about being let down so well that she's erected a bit of an unconscious barrier between herself and her success. At a party in Nashville to celebrate her first platinum record, champagne was flowing, people were shouting their congratulations. But it was only when she saw it on TV days later that she thought, "Wow, I enjoyed that night. That was fun. And I kind of celebrated it again, almost for real." When I ask, "So have you had a moment where you realized that you have everything you've worked for and dreamed about?" she says no. "I don't know why that is. I'm just so focused when I'm doing things, I've just got so much to do...."
As a kid, Twain's big Nashville dream was touchingly simple: she wanted nothing more than to bump into her hero Dolly Parton, queen of the back-comb. A few years ago, she did. Twain was humming one of her own tunes to herself on an airplane, and Parton, who was on the flight, asked her what the tune was. But Twain was too shy to answer. "My one chance to talk to Dolly Parton and I didn't take it! But I want to know her. I definitely want to know her at some point." Her voice is strong with resolve. I have no doubt they will meet again.